This decorative Talavera plate is a contemporary example of Talavera today. Artist Cesar Torres unmasks the past and portraits the present in a vide-poche rustic Mexican elegance. The Talavera is not just a simple painted ceramic: its exquisite decoration is the product of a delicate process of alchemy that translates into Fine enamels. In Puebla, Mexico few people still produce using Talavera with the ancestral techniques. One of those few is Cesar Torres, Don Cesar learned his art in the workshop of the Uriarte family, an excellent workshop where his grandfather worked. In his creations he uses the black and white mud that is obtained from the nearby hills of Loreto and Guadalupe, and colors of mineral origin that he creates in his workshop with recipes from his grandfather. All the pieces are modeled in a traditional way and go through a production process that usually takes from one to two months, between drying, burning, and painting. Being surrounded by a living tradition, Cesar Torres Jr., learned from his father since childhood. Architect by profession, Cesar Jr. has come to revolutionize and modernize with new designs and ideas of the current world, nevertheless always respecting the tradition of the processes and materials that make Talavera a Creole art. To this day, father and son together join forces to unite their ideas and leave both tradition and contemporary ideas in an ancestral art. 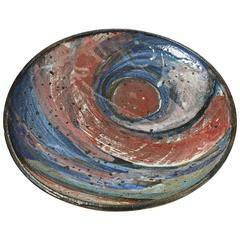 This piece has been crafted with natural clays and enamels, always conserving the traditional, method dating back to the 19th century. Handmade by Master Artisan Cesar Torres in Puebla, Mexico. The Denomination of Origin: Talavera, issued in 1998 by the Mexican Institute of Industrial Property (MIIP) and the Official Mexican Standards (OMS), guarantees the authenticity of the production process and the highest quality of each one of our parts. Denomination of Origin, refers to a geographical indication given to a product, that by their history, materials, labor and quality, can only be produced in a specific area. In September 1997, the Mexican Institute of Industrial Property (MIIP) attaches to Puebla, and in particular to the Municipalities of: Atlixco, Puebla, Cholula and Tecali. Talavera's history: Originates in Baghdad in the 9th century. The Arabs with the desire to imitate the Chinese ceramic that came to that area, discover this ingenious technique. They transported to Spain during the invasion of the moors and subsequently set roots in Mexico with the Spanish conquest in the 16th century. Eine wichtige Keramikplatte von Alain Gaudebert. Perfekte Originalbedingungen. Signiert unter der Basis "Gaudebert". circa 1980-1990.